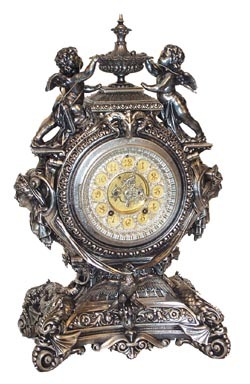 Ansonia Clock Co. "Lydia", ca 1894. You would have tosee it in person to really appreciate the complete restoration of this outstanding early Ansonia clock. Bruce Baziluk refinished it in silver, which is one ofthe finishes Ansonia used on some early pieces. I dont know where they are, but you just never see one on the market. The catalog pictures almost showyou nothing. I will try to describe it but there is too much detail to doit adequately. The four feet are sea serpents that are intertwined on thesides. Above them, on each side is the bust of Lydia?, and standing aboveher is a cupid with bow and quiver. The cupids are reaching up toward theurn which is designed to look like a pool of water with lily pads. At thebottom-front, an eagle with wings spread. Above the eagle is the unusual dial, sash, beveled glass, hands, and open escapement mechanism, all done up insilver, except for the brass numbers and brass inner dial. Above the dial, are a rams head, and then the urn on top. Total piece is almost 20 incheshigh and 12 inches wide. 8 day movement strikes half hours on a gong. Thisis one nice, big clock, beautifully done up. Awfully tempting to keep a whilelonger as the prices keep going up much faster than the stock market. Ly-Ansonia No. 1585.